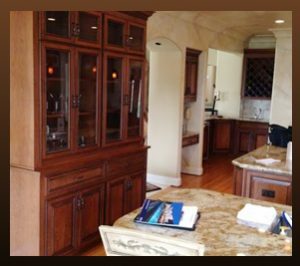 We are passionate about creating custom cabinetry via refacing and replacement for any room in your home. We serve the Bay Area, Sacramento, Yuba City, and surrounding locales with excellence. Our three decades of experience 30 years of experience have earned us a reputation for superior craftsmanship. We are here to make your dream cabinets a reality! 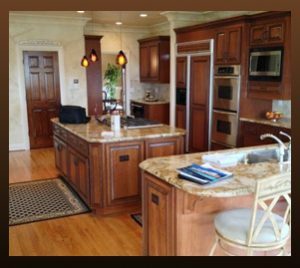 We use top-of-the-line materials including cherry, maple, oak, bamboo—or any other species of wood that you prefer to build or reface cabinets from scratch. Putting our imaginations together with yours, we strive to design and create your dream kitchen and other cabinetry projects. We guide you through the entire process from design through installation. We help in the selection of materials, styles, and colors for the best end result and a completely custom look. Once the woodworking phase is complete, we then stain and install each piece ourselves. As experts at cabinet refacing, we skillfully apply wood veneers to the faces of doors and drawer fronts. Refacing is a very cost-effective alternative to replacement and is frequently used when existing cabinets do not need replacement. The refacing process is typically much faster than custom work, and installation can be done in one to two days. Although our primary focus is residential homes, we are also experienced in commercial designs and installation. We take great pride in our work and our customers are always our top priority. Focused on exceeding expectations, we work hard to ensure complete satisfaction with our incredible cabinetry and unmatched service. We love helping to make your dreams become a reality!